In some cases, it is slightly unclear which cables are connected to the Mult. This screenshot is from Tricky lead preset. The second one shows the Mult view for Pitch. You will see that the green cable for Gate seems to be connected to one of the Mult sockets. 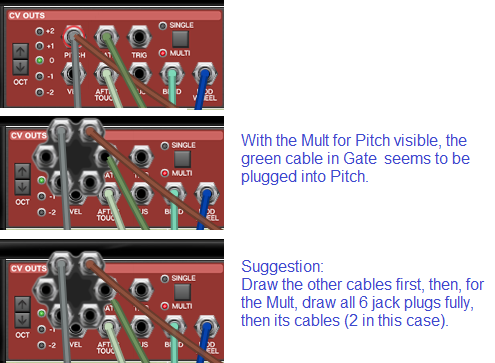 The third picture is a mock-up showing a suggestion: draw the "other" cables first, then the Mult's 6 jacks in full, then its connected cables. This will make the view clearer. As a further idea: when a Mult is open, make all the other cables that are not connected to that Mult transparent?? Edit: Oops, typed the wrong jack label. And added a clarification. Last edited by DarkStar on Tue Feb 12, 2019 10:00 am, edited 2 times in total. Good ideas. Also - I like the mode in which all cables are transparent except the current jack you are hovering over. Thanks!